3-6 months and 6-12 months. 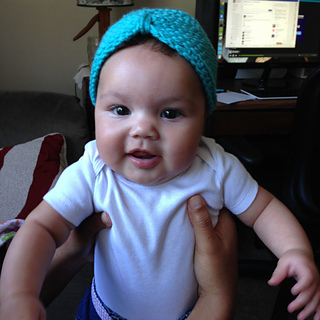 Infant hat measures 7 inches by 4.5 inches (turban “point” goes down 3.5 inches) 3-6 month hat measures 7 inches by 5 inches. Turban “point” is 4 inches from top of head to cinched part. All measurements taken flat. There is a YouTube video that highlights all steps. Check out the YouTube video tutorial here. A head to place hat on.